Dan and Marina's Pacific Crest Trail Hike: On my way to agua dulce: Detroit's shiny new airport. On my way to agua dulce: Detroit's shiny new airport. Landed in Detroit on my layover to LAX. Landing brought back college memories, since the last time I was at this airport was when I was flying back and forth from Williams to Mike Close, my then-boyfriend's house in Rochester Hills, Michigan. And it sure didn't look like this in 1999! There's a shiny new express tram and lots of arty touches. 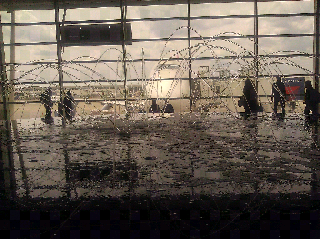 My favorite is this beautiful granite indoor fountain, with choreographed water flows. On to LAX! Just now really sinking in that I'm on my way to meet Dan and there's nothing I need to do for the next 4 months except walk toward Canada. I have done so much for my mom in the last month, and I was sad to leave her this morning! But also excited to do nothing but walk now, and heal. Backpack full of yummy hiking treats, like hazelnuts and dried mango. Here we go!